Just how much will you need? It may be the biggest financial question in your life. Here's a simple approach to finding an answer. Just how much are you going to need in order to retire comfortably? It may be the biggest financial question in your life. With 80 million baby boomers now heading into the flight path for retirement, it's a pressing one, too. Yet a horrifying number of people have never even asked it -- and may not know how to find answers. Earlier this month, a survey from the Employee Benefit Research Institute, a leading nonprofit in the retirement field, found that fewer than half of workers, 46%, had tried to calculate how much they would need for a comfortable retirement. So how do you go about working out the answer? There's a simple five-step approach. Start by estimating your "target retirement income." That's simply the annual income you think you will need to live comfortably in retirement. Some experts advise drawing up budgets. But if you are looking for a ballpark figure, there is a simpler approach. You can just assume that the discretionary income you are likely to need in retirement is about the same as the one you have now. It's not perfect, but it's a good place to start. So take your current gross income, and deduct the costs you no longer expect to have once you are retired. That includes your payroll taxes. It includes the amount you're saving. It may include temporary expenses, such as college costs for your children. And if you are currently paying a mortgage, and expect to have it paid off by the time you retire, it includes the mortgage costs, too. What is left after these costs is your discretionary income. If you want to know what you will need in retirement in order to live comfortably, that's as good a guess as any. Work out how much you are likely to get each year in retirement from Social Security. The Social Security Administration has online calculators to help. You can find them at www.socialsecurity.gov/planners/calculators.htm and www.socialsecurity.gov/estimator. Be aware that delaying your retirement date, up to the age of 70, will earn you higher Social Security payments. Remember to count your spouse's likely benefits, too. Don't forget any income you are likely to get from other sources, such as a traditional company pension. These used to be the bedrock of retirement planning, but fewer and fewer workers are covered by them now. Companies have shifted toward 401(k) plans, where the investment risk is borne by the employees rather than the employer. Even those who are still covered by traditional pension plans typically rely on them less. These plans reserve their biggest benefits for those who stay with the same company for their entire career, and who does that anymore? If you are still covered by a traditional pension plan, you should contact the administrators to find out how much you are likely to get when you retire. With these three pieces of information in hand, you can now work out how much retirement income you will have to provide from your own savings. 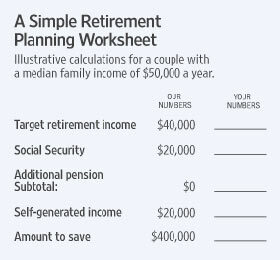 The answer, simply enough, is your target retirement income (step one) minus the income you can expect from Social Security (step two) and any traditional pension (step three). And from this you can estimate the savings you will need to accumulate in order to generate that income each year. It's about 20 times as much as the annual income. In other words, if you are going to need to generate about $10,000 a year in retirement income out of your own resources, you will probably need to save about $200,000 by the time you retire. If you want to generate about $50,000 a year, you will probably need to save $1 million, or 20 times that. Why 20 times? It's simple math. You don't want to run out of money, so to be safe you should really save enough to last for several decades. Many of those turning 65 in decent health these days should plan on lasting into their 90s. And when you are retired, you should probably plan on the basis that your investments may only earn 3% a year above inflation, maybe even less. Investors may earn more, but those in retirement are probably going to want to play it reasonably safe. Based on those assumptions -- they are, I admit, conservative -- you will need to save about 20 times the annual income you need your savings to generate. Those who want to be even more secure could save 25 times. For many people, this savings target will work out at around eight times current gross income. That's because the target retirement income is often about 80% of current income, Social Security aims to replace maybe 40%, and 20 times the difference is eight times. (If you've paid off a mortgage, you will need less). Some people will tell you this figure is too high. They'll tell you a 65-year-old today can buy a lifetime annuity of $10,000 a year for about $130,000, or 13 times as much. But this is a dangerous illusion. It ignores inflation.